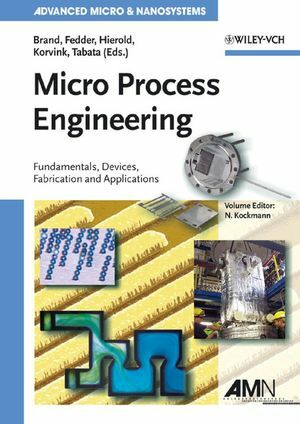 This edition of 'Micro Process Engineering' was originally published in the successful series 'Advanced Micro & Nanosystems'. Authors from leading industrial players and research institutions present a concise and didactical introduction to Micro Process Engineering, the combination of microtechnology and process engineering into a most promising and powerful tool for revolutionizing chemical processes and industrial mass production of bulk materials, fine chemicals, pharmaceuticals and many other products. The book takes the readers from the fundamentals of engineering methods, transport processes, and fluid dynamics to device conception, simulation and modelling, control interfaces and issues of modularity and compatibility. Fabrication strategies and techniques are examined next, focused on the fabrication of suitable microcomponents from various materials such as metals, polymers, silicon, ceramics and glass. The book concludes with actual applications and operational aspects of micro process systems, giving broad coverage to industrial efforts in America, Europe and Asia as well as laboratory equipment and education. Dr.-Ing. Norbert Kockmann is scientific researcher at the chair of microsystem construction of the Institute of Microsystem Technology (IMTEK) of Freiburg University, Germany, since 2001. He began his studies of aerospace engineering in 1985 at the Technical University of Munich. After completing his diploma, he joined the production technology department at Bremen University in 1991 to obtain his Ph.D. in technical thermodynamics, heat and mass transfer. In 1997, he joined the Messer Griesheim company as a trainee and went on to become project leader of a syngas plant for the production of carbon monoxide. His research interests include the construction and manufacture of components for microsystems as well as the fundamental processes in microsystems.